Ontic Structural Realism is a version of realism about science according to which by positing the existence of structures, understood as basic components of reality, one can resolve central difficulties faced by standard versions of scien- tific realism. Structures are invoked to respond to two important challenges: one posed by the pessimist meta-induction and the other by the underdetermination of metaphysics by physics, which arises in non-relativistic quantum mechanics. We argue that difficulties in the proper understanding of what a structure is undermines the realist component of the view. Given the difficulties, either realism should be dropped or additional metaphysical components not fully endorsed by science should be incorporated. The paper is a very thorough, well argued critique of the now very fashionable “ontic structural realism,” as proposed, for instance, by James Ladyman and Don Ross in their Every Thing Must Go. The context for this discussion is the long standing debate in philosophy of science between realists and anti-realists, about both scientific theories and the entities (e.g., electrons) that they posit. The ontic structural realist advances a metaphysical thesis to the effect that structures and relations are the fundamental components of the world; objects are secondary— they should either be eliminated or at best re-conceptualized in structural terms. Our aim in this paper is to show that it is unclear that a proper characterization of structure suitable for ontic structural realism can be offered. We argue that there are far too many distinct ways of characterizing structure and relations, and as a result, the combination of realism and a metaphysics of structures becomes, at best, prob- lematic and, at worst, incoherent. On the one hand, ontic structural realists argue that theories are better characterized in accordance with the semantic approach, rather than in terms of the syntactic view of theories and related approaches to structure based on Ramsey sentences. On the other hand, the semantic approach is typically formulated in terms of set-theoretic structures. But this commitment to set theory, we argue, introduces objects as key components in the characterization of structures, and is responsible for the tension. This strategy is called the “Poincare` manoeuvre” by Steven French (2012, p. 23). According to it, objects are used merely as heuristic devices or stepping stones to obtain the structure. After the structure is characterized, the objects are left behind: either they are taken as metaphysically irrelevant entities or are only conceived as being derived from the relations, depending on the kind of OSR that is assumed. This maneuver, however, faces significant difficulties. First, in set theory, struc- tures are obtained as elements of the set-theoretic hierarchy. As noted, on the set-theoretic account of structure, objects are used to construct relations and struc- tures, not vice versa. The indispensability argument aims to establish commitment to objects that are indispensable to our best theories of the world (for discussion and references, see Colyvan 2001). It was originally designed by W. V. Quine (see, e.g., 1960) to force those who are realist about scientific theories to become realist about the mathematics that is indispensably used in such theories. We understand the “indispensability thesis” as the claim that scientific theories cannot be formulated without reference to mathematical objects, relations and functions. We understand the “inseparability thesis” as the claim that it is not possible to separate the nominalistic content and the mathematical content of a scientific theory. The indispensability thesis may entail the inseparabil- ity thesis, but not the other way around. The deflationary nominalist grants that mathematics is indeed indispensable to science, but resists the conclusion that this provides any reason to be committed to the existence of mathematical objects and structures. This is achieved by distinguishing quantifier commitment (the mere quantification over the objects of a given domain, independently of their existence) and ontological commitment (the quantification that commits one ontologically to the existence of something). The problem with the introduction of ontologically neutral quantifiers in the con- text of structural realism is that, given these quantifiers, it is unclear how structural realists will manage to specify what their realism amounts to. Unless they provide an independent mechanism of access to, and specification of, the structures they are realist about, the use of ontologically neutral quantifiers will ultimately remove all ontological content from structural realism. Mathematical structures only represent the nominalistic (physical) content, which is the content structural realists are ultimately committed to; they need not be committed to the mathematical content. In other words, the set theory that structural realists invoke only play a representational role; it does not provide any guide to the commitments structural realists have. In response to the point that OSR does not entail mathematical platonism, the sit- uation is more complex than it may initially appear. On the surface, it may seem that the two views are independent from one another. After all, OSR is a form of realism about the (fundamental) structure of reality. As such, it seems to make no claim about the existence of mathematical structures—which is the scope of a structuralist version of platonism (that is, a form of realism about mathematical structures). But, in fact, if the mathematical content of a theory cannot be separated from its physical (nominalistic) content (Azzouni 2011), it is unclear how the struc- tural realist can restrict ontological commitment only to the physical content without having first already nominalized mathematics. A structure is characterized (in a loose sense) by both objects and relations, but for the structural realist only relations are primary ontologically. This is a good indication that relations are the fundamental components of the world, and indeed ontic structural realists emphasize this point (see, in particular, French 2010). But this means that in order to understand the nature of structures, we need to understand the nature of relations and of the connections they bear to objects. Metaphysically speaking, relations are far from being uncontroversial. They are at least as controversial as properties. To speak of relations as primary components of reality, one cannot speak of them as being somehow abstracted from objects— since, in this case, they would be ontologically dependent on objects. Rather, in order to have ontological primacy, relations need to constitute such objects. Given that structure gives rise to objects (which are read off from the relations), how can one make sense of the disparate objects that emerge in distinct theories that share part of an underlying structure? Since some part of the structure is the same in the old and in the new theories, at least one of two options should obtain: (i) some features of the resulting objects should be the same in distinct theories, that is, there is also a form of objectual continuity through theory change, or (ii) since some structural preservation should be maintained throughout, this induces some continuity at the level of objects too, since these objects are characterized in terms of the relevant structures. However, both options entail a form of objectual continuity through theory change, something the structural realist has banned, given the pessimist meta-induction. By positing some essential structure that gets accumulated, structural realists end up admitting that in the long run (even if it is supposed to be a very long run), as scientific theories get closer to the truth, the objects will get progressively closer to being fixed by the accumulated relations, and so realism about objects will be justified too. If the structural realist does not allow for some fixed, essential structure to be preserved through scientific revolutions—allowing for modifications even in the parts considered essential—then there is no reason to suppose that in the long run, after many instances of theory change, any structure will be ultimately preserved. Given the considerations above, ontic structural realists are unable to specify the nature of the structure they are supposed to be realist about. There is underdetermination both at the mathematical and the metaphysical levels. If OSR is the best combination of realism and structuralism in philosophy of science that is also able to make sense of quantum physics, perhaps the realist component needs to be dropped. The very idea that there is a true, fundamental, underlying structure of the world—in whose existence we must believe—is difficult to make sense of, as the above arguments have indicated. One needs to acknowledge that the truth or plausibility of the proposed metaphysics will not be settled on purely scientific grounds. By giving up on a strict naturalistic methodology in the metaphysics of science, one can introduce discussions about theoretical virtues in metaphysics, and then invoke those virtues to claim that OSR fares better than the alternatives, at least on prag- matic grounds. However, if a naturalistic metaphysics must go, then we must abandon the idea that OSR is a metaphysics tailored to fit our physics, and without this most cherished motivation, OSR is leveled with other metaphysical packages, disputing priority on a priori grounds. I thought the target paper was a nice transect through a whole lot of areas. And I have learnt a new word, ostension 😉 I think the argument in the paper against this fails against the objection that science is all about pointing as exactly as possible. Mario Bunge pushes for a Pragmatic metaphysics, with the term realism reserved for the epistemology, and ontology separately “as general science”, “in the very marrow of science”, as “all generalizations about facts…involve ontological categories”. This implies our ontology will be changing all the time as we learn more, so I guess we shouldn’t get hung up on the changeable nature of scientific truth and underdetermination. We just provisionally accept a naturalistic ontology, devise tests for it, and discard or revise it as necessary. In his way of thinking, the realist epistemological assumptions are that reality is knowable, and logic/maths an appropriate tool, so we assume we will continue to progress. Metaphysical realism as defined by Putnam is that there is a single true representation that our theories can converge towards, but I don’t think such a strong assumption is necessary. Objects are central to his ontology, and Bunge makes much of a distinction between objects and processes that act like objects: his example is photons and phonons, where I presume a structuralist view might make phonons first-class objects. Unfortunately, he then points out that epistemology depends on ontology: “epistemological realism without materialism is vulnerable and useless to science, because one may adopt Plato’s or Hegel’s objective realism”, which is a bad thing! You mean like the multiverse, or string theory? Yes! String theory is an *attempt* to produce better theories. String theorists are “out-riders” exploring the mathematical structures that might be the key to a unification of quantum mechanics and relativity. But, physicists would not regard string theory as an end in itself independent of any evidence for it. That — perhaps — is different from metaphysics, which can be seen as an independent subject in its own right, regardless of any evidence for it. As for a multiverse, if we’re talking the chaotic-inflation multiverse then there is evidence for that model and I still don’t see any decent objection to it. A standard cosmological model has an infinite extent of stuff, with different inflationary versus non-inflationary states at different *times*. 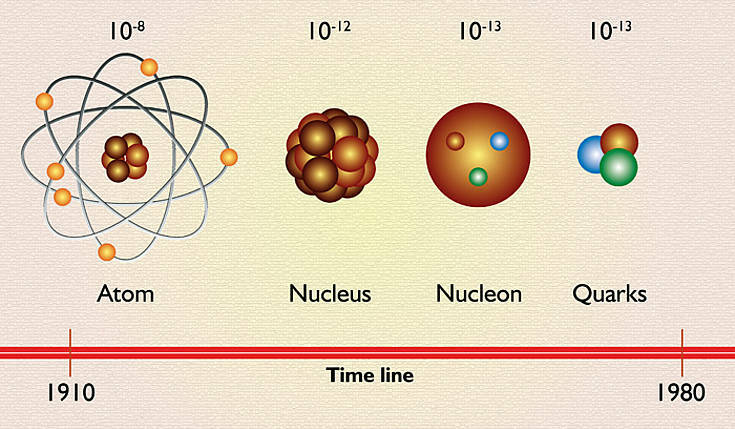 The chaotic inflation (= multiverse) model is the same, but with different states at different times *and* places. And that’s because the models can’t make the transition everywhere at once. So we’re forced to a chaotic inflation model, unless we ditch inflation entirely. In which case you would need a whole new model to explain all the strong observational evidence for inflation. thanks for your helpful comments. However, I still feel we are talking about the same point: that somehow there are objects there, even if at a minimum level. The problem the argument tried to raise was that, even if objects in CT have no property of their own, they are still there, even if just as place-holders, as it were. Is it correct or did I miss something in your comments? That looks, in the second part, at least, very much in the direction of Ladyman and Ross naturalism: as organisms evolving in a large scale world, we are not biologically “equiped” to deal with the ultimate aspects of reality, which are unobservable and definitely are much different from our every day world objects. So, (and here comes the naturalistic metaphysics of Ladyman and Ross), instead of stoping asking metaphysical questions, we should look at our best theories to describe reality, mainly to the mathematics employed in such efforts. So, it seems, a rather similar constation about our limitations may be used to promote metaphysics (of a structural kind, in the case of L/R, of course)! In fact, some scientists think metaphysical questions may be answered by science (recall the discussion about “nothing” by Krauss), and some philosophers seem to believe it too. The great problem, it seems, is toescape such all or nothing views and to find a “productive colaboration” between science and metaphysics. As far as we know, it seems the best science can do is to sort of “reject” some metaphysical views, when they are clearly articulated with a scientific theory. But it cannot provide for support for any specific metaphysical view, for underdetermination appears very often. I find this debate quite interesting. I could definitely sense in one of my philosophy teachers that he sort of wished he went into science, and there has come into philosophy this reverence of science. It seems it has only grown since I left college. But philosophy deals with the far more interesting questions than science. How can I say that? Just ask main street what living scientists they even have heard of. I would bet that 90% of them are known because they break outside of science and enter into philosophy. Like Krauss’s philosophical claim that everything we can know is based on science. People don’t care that much about science itself – and to some extent for good reason. They are interested in what science limits are and that is pretty much philosophy not itself science. I would add: what particles are smaller than atoms? How do they interact with each other? How can we obtain a vaccine for X disease? How can we make a faster computer? How do cells obtain energy and stay alive and what different variety of cells are there? How do synapses work? How does genetic drift work? The questions I ask are to some extent even more properly scientific than the article’s questions. The questions from the article are sufficiently vague and have a glean of philosophy and that is why they are more interesting. But even there, let’s say they found “all this” (whatever that means) just always existed. Ok that’s pretty neat. But so what? None of the questions science can answer will ever address how I should live except indirectly. And that is what rational people want to explore. That’s why scientists who talk about philosophy are often better known than those who stick to science. People think science is neat and valuable but it’s clearly limited and unlikely to change their values. I do have an interest in science and I do enjoy it. And I admit that I probably would enjoy learning a bit more about it. So I downloaded a few “great courses” on it. I was just listening to one course 12 essential scientific concepts and the professor was clearly enthused by science and wanted to share that enthusiasm. So what question does she start out asking? “What is the meaning of life?” Honestly it was no surprise because that is an interesting question. Of course 2.5 hours into the course I learned some interesting science, but of course nothing even closely addressing the question. In the end it is, and will continue to be the scientists who dip into philosophy that will capture the interest of most people. And there is good reason for that. Since I have been addressed directly, let me answer, because it is important to realize that mathematicians and physicists have been obsessed by structures. Category Theory, or rather, Category Theories is a practical tool in many esoteric parts of mathematics (such as knot theory). So the situation is very different from Set Theory, which was meant to be just a foundation (and proved hopelessly complicated). Category Theories provide mathematicians with powerful theorems, which are used in other fields (without necessarily knowing how they have been proven). The game consists in revealing that the mathematical structure at hand can be viewed, modulo a “functor”, as a known category, and then apply blindly the theorems therein. Geometry is any structure where angles, and thus parallel transport, can be locally defined (through what is called a connection). It’s applied to objects even more general than manifolds (= n dimensional space), fiber spaces and orbifolds. Category Theory worries only about structure and relation, not considering (for example) numbers, and computation. Foundational problems re-appear, but are swept under the table by changing Categoroes, as needed. Descartes famously said: ‘I think, therefore I am’. However, how is thinking achieved, and what does it consist of? Mostly in establishing relations. One can argue that the skeleton of thinking is provided by the axons which bind distant neurons together, which allow them to establish a relation (similar to the morphisms of Category Theories). Mathematics is the study of structures (hence the rise of CT). And most of them were imagined first. For example Elie Cartan invented spinors in 1913, and Dirac stumbled on them 20 years later, when he invented a first order partial differential equation for the electron respecting relativity. I hope this technical perspectives help. Thanks Jonas, good to know that some of those who are much more blessed than I mentally, also have the ability to see things so simply! In the end I suspect that the real trick will be for us to use the same process by which we order our lunches (as I’ve mentioned above), to develop a community with accepted understandings regarding certain philosophical dynamics of what we *are* (not of what we would like ourselves to be). Here I envision both practical, and even simple theory regarding the essentials of human dynamics. But will metaphysics make the cut? In this regard I simply do not see much use for determining what ultimately exists. It’s metaethics that I believe is needed most for this project — though not the traditional sort where we attempt to determine what we would like ourselves to be. Instead this would be an ethics where we describe the biological nature of good/bad, or reward/punishment, for the conscious entity. With such a premise from which to work, I believe that our currently primitive mental and behavioral sciences, could instead become tremendous examples of human science. I very much hope that this project is of interest to you (and certainly others! ), and if so, please do get in touch! Thanks Patrice for referencing me in your discussion above, as I am indeed here to learn from Massimo and those who reside in his wonderful community. Got to read the full article (thank you Massimo for pointing that out), and I definitely have some thoughts on the paper and the comments thus far. I want to examine a few things, and it will be at some length, so my thoughts will run over several comments that I’ll submit for this post. (Massimo) ”I know, but I find that argument wholly unconvincing. First off, there is no such thing as “empty space.” There are fields everywhere. Second, it doesn’t matter how relatively little “physical” stuff there is in the universe, there still is some, and it is responsible for everything we actually call “the universe.” Considering mathematical structures “real,” instead, gets us nowhere because nobody — not even Max Tegmark (trust me, I’ve seen him stumbling in a room full of philosophers) — can make any sense of the concept. (Massimo) Yeah, I see that as a limitation of modern particle physics, not as a reflection of how the universe is. That paragraph is stripped directly from the SEP page on QFT (interesting to note Ontic Structural Realism featured prominently on that page in attempting to actually understand what’s going on). What does all this mean? Literally, it means that the vastly complex and amazing “rigid” world you see around you is a lie. No, please don’t mistake me for some sort of crackpot idealist. Again, I’ll reiterate that I’m still a naturalist and the world obviously contains structures and laws/generalities that are objective and that we’ve uncovered in great detail. What I’m saying is that the common sense folk psychology that we’re all accustomed to doesn’t exist. [If you’re high, skip the next few sentences. It might be too much] Yes, you are sitting on a chair and reading on a computer that your brain takes to be “solid” and “rigid.” Yes, the Pauli exclusion principle and electromagnetism allow for these sorts of large-scale amalgamations to exist in our world. But we’ve peered into the inner workings of nature and we have empirically verified that it’s a whole lot of nothing all the way down, and our most intelligent scientists can’t explain to us what the most basic constituents of our world (those quantum fields) actually are! That’s part of a recent Quora post from Barak Shoshany, a Graduate student at the Perimeter Institute for Theoretical Physics (where Smolin is currently a faculty member). That whole “abstract quantum object” phrase he uses should be a final nail in the coffin for those hoping to hold on to some terra firma at the basis of reality. But the physicalist/materialist isn’t even hanging on to the ledge anymore. Taking all that I’ve just mentioned into account, it’s really not hard to make the leap from object-oriented realism to some variety of structural realism. I get it, “relations without relata” is a pretty weird concept to wrap your head around, but it’s a shift in ideology resulting from how our scientific theories advance and what our best empirical evidence delineates. That’s a hell of a lot more scientifically informed than any of the other metaphysical positions I know of. Now, bearing all of the above in mind, what’s our next step? Ladyman, Ross, and others believe that the OSR approach could be very important in guiding us, and for a relatively new idea I think it is a very promising approach that needs to be explored further. I managed to read the entire paper (thank you Massimo for pointing me to the link), and there are a few arguments in particular that I think are a bit suspect. So I’m not so sure about this argument in the paper, and I think there’s a case to be made that continued advances in these mathematical domains could add some powerful weaponry to the OSR arsenal. 2)	As far as the Lowenheim-Skolem “Paradox” is concerned, would this not be completely irrelevant if someone subscribing to OSR wanted to lay their mathematical foundations with second-order logic (think second-order arithmetic), which doesn’t fall victim to the paradox? 3)	The whole “well this is a pragmatic consideration, and only science should be the arbiter for our naturalized metaphysics” argument against OSR doesn’t really hold water. If modern science has shown that our preconceived common sense notions of material objects (being all bulky or “thick” with matter) is actually very far removed from reality (it is), and all that exists at base are mathematical equations and group theoretical structures, isn’t that powerful evidence that we should be looking at structures themselves rather than objects? We do not have to take physicists at their word when they make philosophical forays: we can avail ourselves of certain formal tools to find out what their theories are really about. For example, around 1930 Bohr and Heisenberg claimed that the task of physics is not to find out what nature is, but what we can say about nature. Any realist philosopher could have told them that the people who analyze what physicists say are philosophers and historians of science, whereas physicists like themselves study atoms, stars, and things, as shown by their formulas and experiments.